If your cellular carrier offers Wi-Fi calling, you can use Apple Watch to make and receive calls over Wi-Fi instead of the cellular network—even when your paired iPhone is not with you or is turned off. Apple Watch just has to be within range of a Wi-Fi network that your iPhone has connected to in the past. To see if your carrier offers Wi-Fi calling, see support.apple.com/kb/HT203032, then enable Wi-Fi calling on both your iPhone and Apple Watch. Note: You can make emergency calls over Wi-Fi, but when possible, use iPhone over a cellular connection instead—your location information will be more accurate. Enable Wi-Fi calling on iPhone. On iPhone, go to Settings > Phone and turn on both Wi-Fi Calling and Calls on Other Devices. 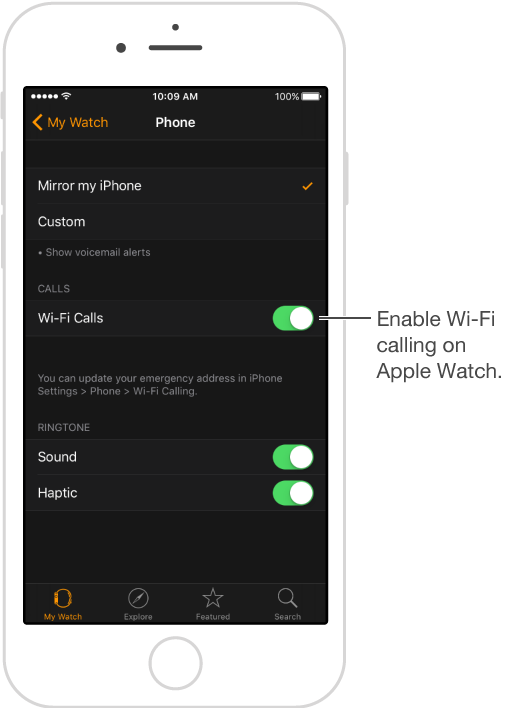 Enable Wi-Fi calling on Apple Watch. Open the Apple Watch app on iPhone, tap My Watch, tap Phone, then turn on Wi-Fi Calls. If you don’t see the setting, make sure you’ve enabled Wi-Fi calling on iPhone.